It’s been awhile since I posted anything new on this blog. Sorry for that. I’ve been pretty swamped working at The Wall Street Journal since last April. * Great Comment on Doriot’s Belief in Importance of Manufacturing on ZDNet blog post. (July 7, 2010). Here’s one that seems appropriate for Labor Day, which also applies to startups of course. A new review was just posted to Amazon.com. Check it out. Thanks Chris! 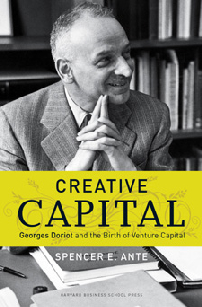 I initially began reading Creative Capital to learn more about the origins and history of the venture capital industry and ultimately became enthralled with the incredible life story of General Doriot. His list of accomplishments is staggering to consider in terms of both scope and impact, but his approach to life was what stood out most. The persistence, care and dedication he demonstrated to the students he taught, his country, the country he adopted or the businesses he financed was truly inspiring. Spencer Ante does a brilliant job of telling his story and putting it into the historical context of the development of the venture capital industry. Highly recommended to anyone with an interest in American history and is a must read for any student or practitioner of finance. This is one of Doriot’s best quotes, not only because it preceded Andy Grove’s famous maxim, “Only the paranoid survive,” by several decades. It shows his passion for being the best and never becoming complacent. It’s gratifying when your work gets recognized in such a respected publication. And it’s even more rewarding when readers and reviewers understand some of the big ideas that you were trying to get across in the book. On that measure, Crovitz, totally got it. Crovitz focused his column on the government’s effort to more tightly regulate venture capital. The U.S. Treasury wants VC firms declared as systemic risks and put under tight restrictions as part of the broader re-regulation of financial firms, notes Crovitz. To bolster his argument, he summarizes ARD’s history of run-ins with federal regulators, and quotes some of my favorite parts of the witty and wise personal memos of Georges Doriot, the visionary Harvard Business School professor who pioneered the venture capital industry as president of ARD in the 25 years after World War II. The dangers of over-regulation is one of the primary discoveries and lessons of my research. Thanks to Crovitz for bringing that point to the attention of a much wider public. Here’s a story published recently in Investor’s Business Daily about legendary investor Arthur Rock. One of the pioneers of the venture capital industry, Rock famously put together the deals to found Fairchild Semiconductor and Intel, two of the most important startups in the history of Silicon Valley. Rock later invested in Apple, capping off his incredibly successful career. The investment landed him on the cover of Time magazine, a story that I discuss at length in my book. In fact, Rock was a student of Georges Doriot at Harvard Business School.